The latest car safety technology doesn't just spot hazards on the road ahead, it watches drivers to see if they're paying attention. 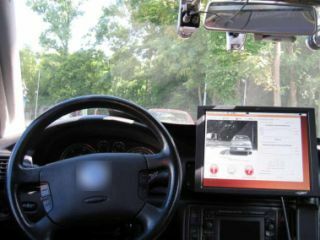 Scientists from six European countries have developed a new computer system so called Drivsco that allows vehicles to learn from the behaviour of people at the wheel. If it spots 'unusual behaviour' when the car approaches a curve or obstacle, it can sound a warning to help the driver stay on track. Drivsco uses a multitude of sensors, including GPS, wheel orientation monitors, brake sensors and artificial vision with depth and image recognition. The system then learns how a new user typically tackles a curve or approaching intersection, pedestrian or another vehicle. Whether a driver is a sporty or a Sunday driver, Drivsco builds up a pattern of how they drive - enabling to spot quickly when something goes wrong. If the driver isn't behaving normally when entering a curve, the system concludes that the driver either can't see the curve (headlights aren't as good as Drivsco's night vision tech) or they're falling asleep - in either case, an audio warning kicks in. "We do not intend to develop automatic driving systems as it would be very difficult for insurance agencies and car companies to come to an agreement in the event of a crash," says Professor Ros Vidal of the University of Granada. Instead, he hopes the back seat cyborg will improve road safety - especially at night, when 42 per cent of accidents occur, despite a 60 per cent drop in traffic.